The Russian Empire was home to people from many countries, who worked, studied, and raised families here. After the Revolution, many foreigners fled – now many of their descendants are trying to unerath their Russian roots. We asked Russian genealogists to tell us about their most interesting cases. Vvedenskoye Сemetery in the east of Moscow was a burial ground for Catholic and Protestant communities – it was also called the “German cemetery.” It is full of crypts, mausoleums, memorial columns, and beautiful graveyard sculptures, one of which stands on the burial site of the Baudelot family. They were famous Russian perfumers of French origin. 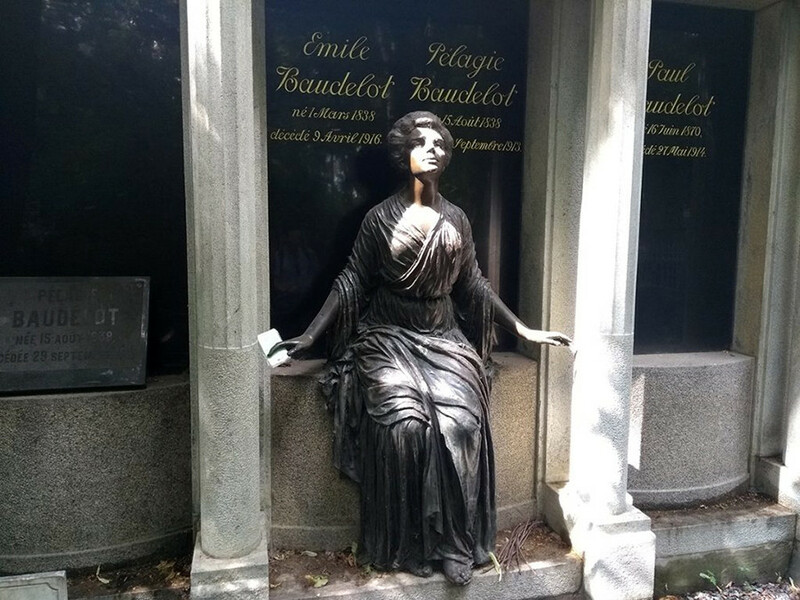 A paper note is tucked between the fingers of a statue’s hand – some of the words are unreadable but what’s left goes like this: “My name is <...> and my mother’s name is <...> Baudelot, I live in France… We’re looking for…,” before it’s signed off with an email address. Throughout its history, Russia has been called home by many nationalities. The French, German, and English (top name but a few), while every profession under the sun including merchants, doctors, soldiers, scientists, and writers worked and found love here, stayed and helped make Russia a great country. After the Revolution and wars, many of those born to these old families fled and returned to the lands of their forefathers, which were alien to them. But now many foreigners come to Russia in search of their roots. 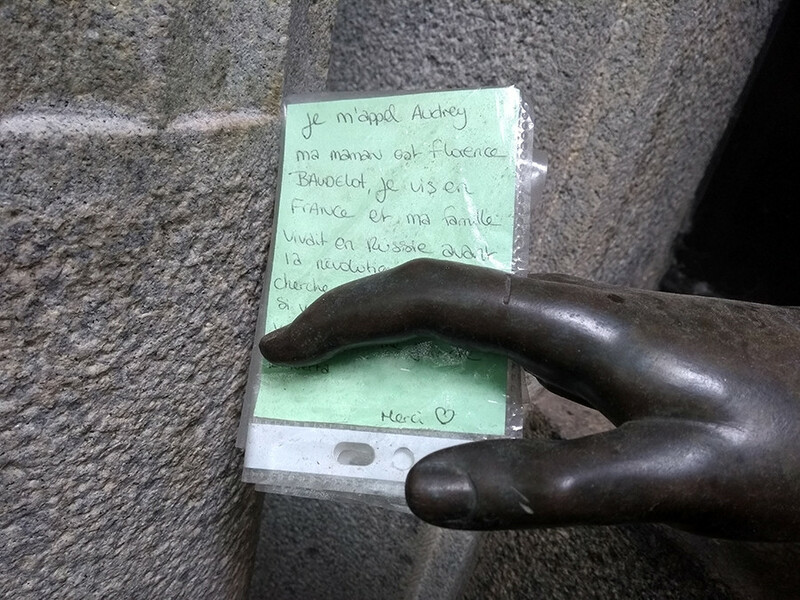 The note in the statue's hand. Genealogical searches in Russian archives are complicated enough, even for a native with a MD in Russian history. Such research requires knowledge of complicated historical sources, like church birth records or draft records. Also, genealogical searches require constant written correspondence with many regional archives. For non-Russian speakers, the hard part is that most archive employees still only write and speak in Russian. So genealogists who are fluent in European languages are in demand. “The second group, almost as big, are American jews, descended from jews from Ukraine, Belorussia, and Russia. Usually, these people don’t speak or read Russian, and their parents couldn’t either. But their parents may have childhood memories of their grandparents recalling life in Russia, or they may preserve some dialect of Hebrew their ancestors spoke. And the third group are descendants of the Volga Germans,” Semenov explains. 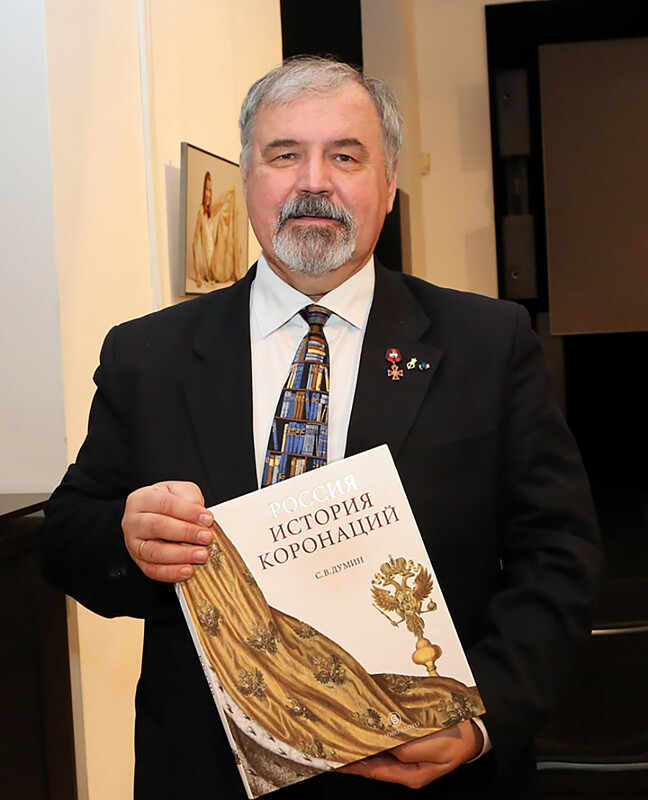 Stanislav Dumin, Chief Herold for the Assembly of the Russian Nobility, holding his book "Russia. The history of coronations." One Russian recently witnessed an astonishing find: In the old Donskoye graveyard in Moscow, a football fan who came to Russia for the World Cup found a grave of his ancestor. 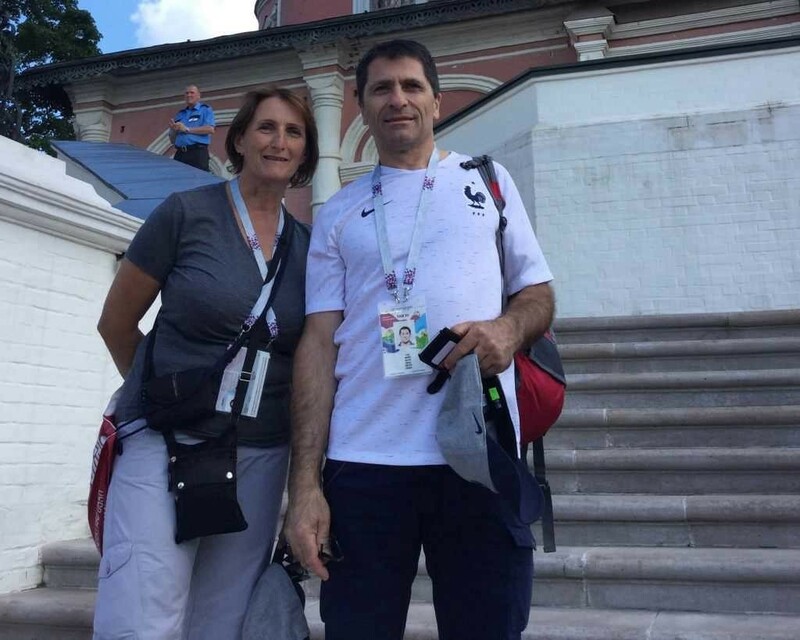 “Here lies my great-granddad, uncle of my maternal grandmother,” Philippe Patrick from France’s Nice region said. “Nikolay Kozlyaninov, adjutant general, Commander of the Kiev Military District.” Philippe said that he and his wife have just been to St. Petersburg and found his ancestors’ city house with a memorial plaque. “My ancestors left Russia right after the Revolution,” Philippe says. Russians and foreigners alike dream of discovering ancestors that are connected to Russian greats of the past, those mentioned in literature, memoirs, or diaries. They consider it more important and prestigious than finding out about “just” wealthy or noble ancestors. So, you’re positive that you have some ancestors in Russia and you decided to find records about them and build your family tree. Where to start? First of all, you should scan all personal documents belonging to your family, especially the old ones – and not only those in the Russian language (if you have them). Secondly, and of equal importance, is the need to talk to your relatives, especially the more elderly ones, about their past. Ask them if they remember names of relatives and places they’ve lived in. It’s best if all talks are recorded. Add full names, dates of birth, and professions to each interview. Scan all your old photos – but only if you are sure who’s in them. Thirdly, it’s time to hire a Russian genealogist. To check them out ask about their latest research including any books they’ve authored or edited. And finally, the cost. Remember that any time spent consulting or working with your data is paid, so don’t start telling your secrets right away, you’ll most likely be charged. The simplest research of the paternal line of your family (only men) should cost around 70,000 (1,000 euros), and if you’re ready to splash the cash, prices for thorough research start from around 1,500 euros. It usually takes about six months to get the initial results. 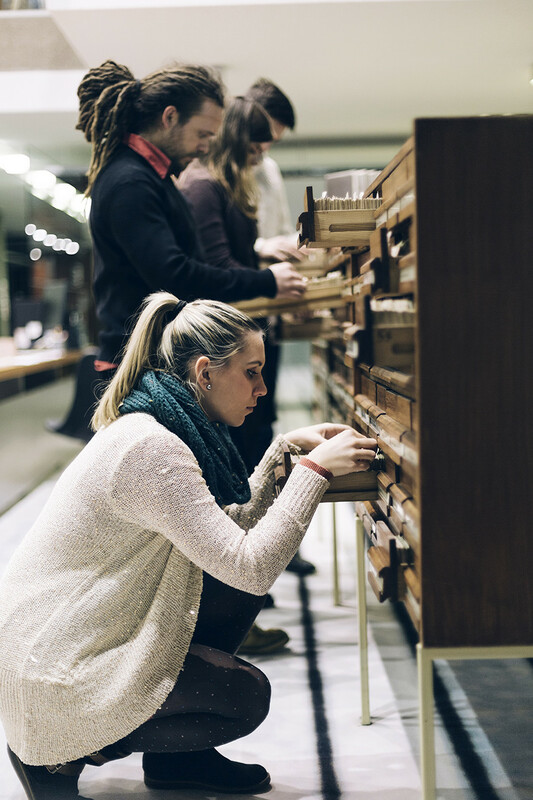 Also, remember that research requires small, but constant payments – if a genealogist is on to some real discovery, they’ll be obliged to double-check all data, which can be costly – but hey, there’s history to be made. Family ties: Can you prune the branches of Russia’s royal family tree?